There’s an uncomfortable reality in public relations. 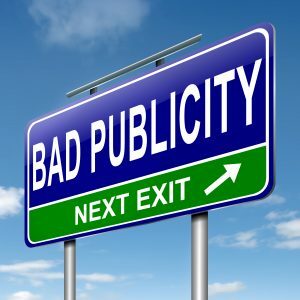 It’s not a question of if your business is going to have a PR crisis; it’s a question of when. Even the best-run companies that follow the rules can end up in the cross-hairs of the press. Especially if there’s a juicy story about an unintentional breach of the law, a lawsuit from a vendor or competitor, or a client issue that’s spiraled out of control. Ultimately, there are three main parts to any crisis. Reputation recovery after the crisis. Your reputation is your credibility. The stronger, more trustworthy your reputation, the more it provides you the benefit of doubt, allowing your reputation to recover more quickly. Many other pages within this website highlight how we excel at helping companies build up good will and your positive reputation before a crisis occurs. Some of those examples include consistent press releases and media relations, scheduling speaking engagements, award submissions and trade show related media support. The part that’s less obvious is how we help companies prepare in advance for a crisis. This includes creating a crisis handling process that everyone knows to follow and a “Media Emergency Playbook” that comes complete with talking points which we develop from potential or worst-case scenarios. By having 80% of what you’d actually say during a crisis written in advance and approved by your legal department, it will save you a huge amount of time and will help protect your company’s reputation and image. Once a problem strikes, a quick and effective crisis communications plan is essential to reducing a story’s threat to your company’s reputation and image. If you are caught unprepared and don’t already have a crisis process in place and a “Media Emergency Playbook,” call us right away and we’ll help guide you through what to do. If you’ve already worked with us to create processes and a “Media Emergency Playbook,” we’ll help you implement the pre-approved plan. We’ll also be with you every step of the way, offering counsel and confidence in your next moves. Since it’s sometimes not practical (or desirable) to have a member of your company serve as a spokesperson during the crisis, we handle that too. We believe that company leaders need to be on record as the good guy—not the bad guy. We’ll take the hits for you at the height of a crisis when someone needs to answer the tough questions or apologize. 10 to 1 PR will serve as the voice of the company and take the hits from the public or media. As we help you get the situation under control, we’ll work with your leadership team to become the public face of the company. Your leaders will explain to the media how the problem is being fixed and what your company is doing to make sure it won’t happen again, so they are seen as part of the solution, not the problem. We will assist the creation of any speeches or press releases during and after the crisis event. We will also serve as your media interview chaperone to protect the company and its leaders if an interviewer gets too aggressive or goes off-topic. While media tends to get a lot of the attention, we know that communicating with your employees and impacted customers is equally important. We’ll be with you every step of the way to make sure these audiences feel like they know what’s happening, what to do, and what to expect so you can give them confidence and trust in your efforts to handle the situation. After the immediate impact of the crisis and bad press subsides, companies need to then rebuild and restore their positive image and reputation. It won’t be easy, and it will take time to regain trust and confidence, but with a concerted effort we can speed along the recovery process. We have lots of strategies ready to employ to help a company “improve the story” and regain the public trust. The strategies change based on the audience and the crisis just faced, but just like an athlete trying to return to their sport, the sooner and more consistently you work towards rebuilding your strength and stamina the better. Want to be prepared for a crisis? Is the crisis already happening but you need help managing it? Give us a call before it’s too late to influence how the crisis defines your company.